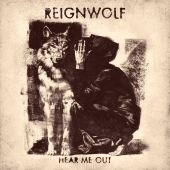 Hear Me Out, the long awaited, highly anticipated debut album from Reignwolf, will be unleashed to the world Friday, March 1st. The band best known for it's raw sound and high energy performances have put the finishing touches on this ten track studio monster. With appearances at major music festivals such as Coachella, Lollapalooza, Austin City Limits and Glastonbury and high profile opening slots for some of the most influential bands including Black Sabbath and Pixies, Reignwolf made a name for themselves worldwide without ever releasing a record... until now!